The latest Clevertouch models all come with our exclusive LUX interface. Our brand new LUX user interface is the most advanced interface ever built into a large-format interactive touchscreen. LUX makes the Clevertouch a beautiful, intuitive experience through expertly designed touch controls, familiar to any owner of a modern smartphone or tablet. Plus Series – Experience the transformative effect of a touchscreen in the classroom. Pro Series – Powerfully present your ideas and effortlessly collaborate with colleagues. Pro Series interactive touchscreens with Montage Lite bring together wireless presentation, communication and collaboration, not just within the meeting room, but across the world. The Pro Series gives you full interactivity to enable annotation of BIM models, CAD drawings, videos and documents through its embedded apps. With apps for annotation over all file types, instant whiteboarding, collaboration and screen sharing, opening and editing office files, and email, the Pro Series has everything needed for day-to-day meetings. 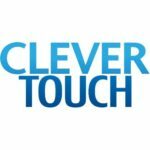 Two Clevershare devices are included – simply plug the device into your laptop to take control of the Clevertouch. Video, Audio and Touch are transmitted both ways wirelessly, and multiple devices can be used. A slot-in blade i5 or i7 4K Windows 10 PC can be added, ideal for conferencing software such as Skype For Business. Inputs can be switched with a single touch, allowing seamless transitions between LUX and PC modes. The V Series is ideal for use in professional settings such as offices, reception areas, meeting and training rooms, yet robust enough for use in schools, colleges and universities. The V Series is also backed by our 5 year de-install/re-install warranty making it the ideal choice if you’re after excellent value over the full range of software and apps, but still want the reassurance that all of the products in the Clevertouch range provide.